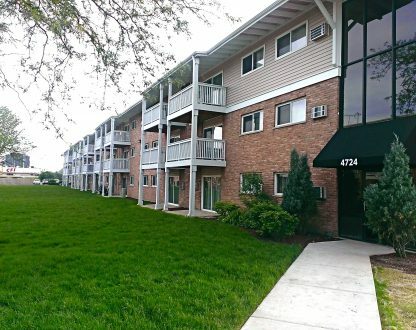 MOUNT AIRY, NC—A newly purchased17-building apartment complex in Rolling Meadows, IL, built in the early 1960s, has seen plenty of tenants make their homes there. When new owners went about making renovations they discovered one 18,000 sq. ft. building suffering from voids in the soil beneath the slabs ranging from five inches to almost two feet in diameter caused by the stratified compacting of the historically hydric wetlands sedimentary soil, and water and sewer main breaks over the years. The voids caused some uneven floors and left the door open for future problems like mold. Sobelman uses TerraThane Geotechnical Polyurethane Foam, by U.S. company, NCFI Polyurethanes. “They pioneered polyurethane foams in the U.S. We’ve been using their products for at least 10 years, and we’re sold on TerraThane because it’s so much cleaner than the old cement method. We drill smaller holes in the slab (5/8” v. 2”), there is much less dust from the drilling and pumping, and the clean up is minimal. Cement grout leaks out of the packers and, often times, requires scrubbing equipment to remove.